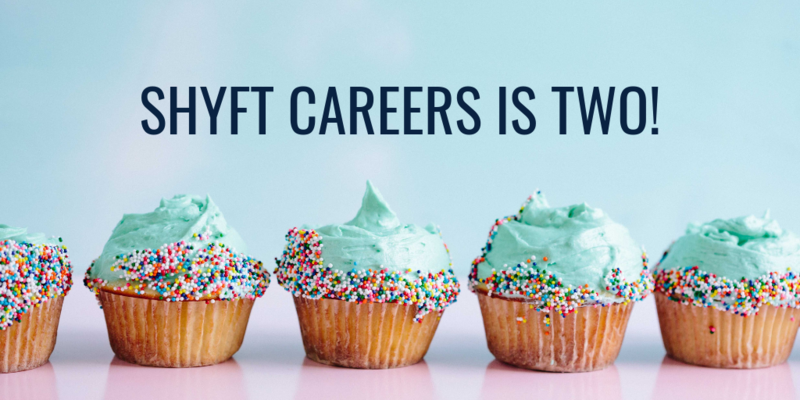 On Sunday, March 17, 2019, Shyft Careers turned two years old, and we couldn’t have done it without you. We are so fortunate to be able to serve such spectacular clients and talented candidates. So, thank you. Thank you for putting your faith in us and thank you for trusting us to meet your employment needs. Shyft has come a long way in two years. Beyond the many dozens of lives we’ve changed for both employers and candidates, we like to think that we’ve played a small role in moving the recruitment industry forward, as well. But, as Shyft’s director of recruitment, Joel Radziewicz, puts it, there is still much to be done. Changing the approach companies take to their staffing and employment decisions is one of the things we love most about what we do here at Shyft. Instead of crossing their fingers and blindly selecting candidates for open positions, we help great companies become destination spots for top talent. We change the mindset. After working with us, organizations are no longer desperately looking for people to fill job vacancies. Instead, they become organizations for which people want to work and find a career. Although our traditional “Contingency Package” will always be close to our heart, we found it necessary to expand beyond the tech and marketing industries, where this model works so well. And don’t worry. We’re not abandoning it. We’re making it better! Within the last two years, we’ve added three more packages, all of which are based on a partnership-driven recruitment model designed to maximize the public profile and personnel talent pools for small and medium-sized businesses of just about any type. The “Find Your Unicorn” package is where we’re continually doing demand generation in your local market. Additionally, we review the strategy and highlight the results we’ve gotten for you each month. This includes who we’ve talked to, who might be interested, and who’s waiting in the wings in the event you need to flip the switch and hire someone right away. With the “Acquire & Retain” package, we manage your entire digital marketing presence,help you develop job descriptions, provide monthly freelance options and referrals, and more. The “Accelerate Your Culture” package is uniquebecause it unifies your entire Human Resources efforts both internally and externally and not only allows you to find and retain top talent, but also helps you develop solid HR policies, processes and procedures. We recognize the importance of building a strong leadership team, which is why we also provide certified DDI Leadership training and coaching, as well. For us, that’s what turning two is all about!